Next we discussed posing a word problem and representing the numbers on the whiteboard, then asking, "How can we solve this problem?" Tip: Write the problem on the board. Read it with the students. 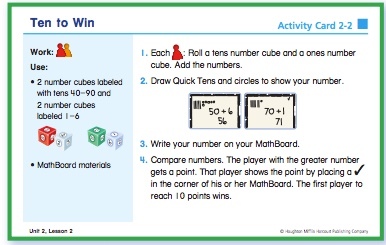 Have them close their eyes and visualize it, then represent it with cubes, sticker strips and singles, or drawings of sticker strips and singles. We also discussed eventually, in an upcoming lesson, connecting to the number line, especially with the strategy of keeping one number whole and then making jumps related to place value. 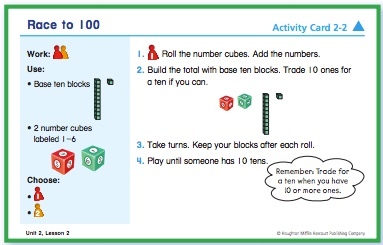 ​This lesson connects the stickers and strips to the number line and the hundred chart, highlighting the strategy of keep one of the numbers whole and jumping by tens and ones. 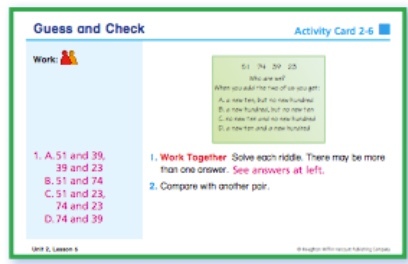 This lesson is more practice solving sticker story problems using different models and strategies. 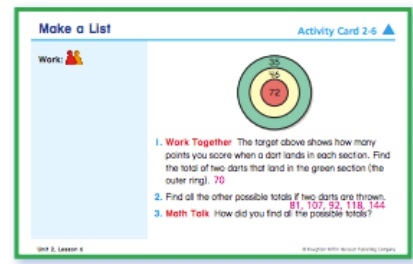 SAB p. 83-84 - Comparing numbers based on place value.